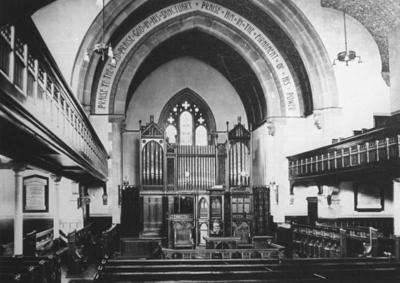 There have been several Methodist chapels and churches in Bollington. 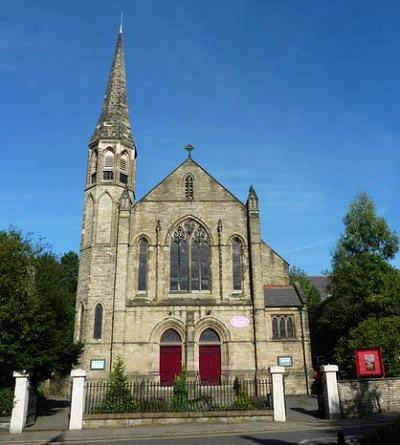 The original four individual groups have merged together to leave us with just one church today, in Wellington Road, but this is no longer used as a place of worship, the small congregation having moved to Macclesfield. There have been three Methodist buildings on this one location, originally known as Knowles Green, since 1808. The first building close to Bollington built for Methodist worship was on Billinge Hill (Rainow, but overlooking Bollington), a small chapel which was in use from 1781-1807. It was sold when it became too small, and is today a cottage. 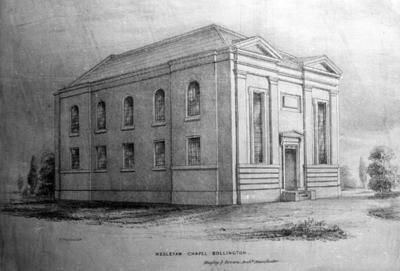 The first Methodist chapel built in Bollington was opened in 1808 on the site of today’s Methodist church in Wellington Road, an area known then as Knowles Green. The ground was provided by Peter Lomas, owner of the nearby Waterhouse Mill. 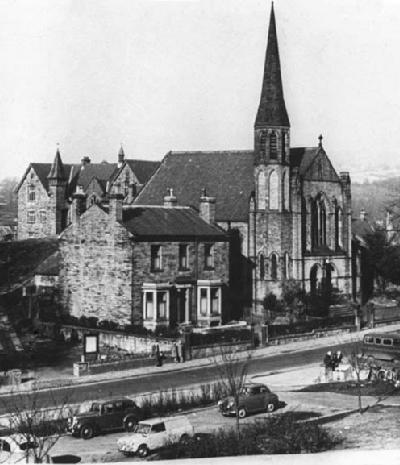 The chapel was also used as a Sunday School for the children until purpose built accommodation was provided close by at the Large Sunday School at the bottom of School Brow (Hurst Lane). 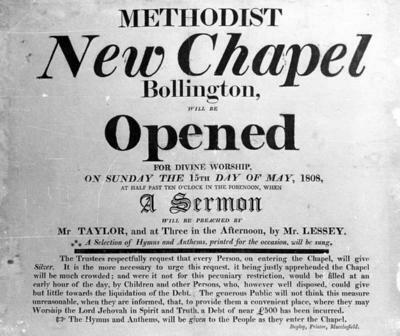 The opening notice for the first New Chapel shows that the first sermon was given on 15th May 1808. The small print at the bottom is a classic of its age! It announces a Silver collection in order to exclude children and others who weren’t sufficiently well off to be expected to help clear the £500 debt raised to build the chapel and who would otherwise crowd the chapel from an early hour! It could hardly be more condescending, but they try – “The [printed] Hymns and Anthems will be given to the People as they enter the Chapel.” Their italics! This second, larger, chapel replaced the first on the same site in 1837. Additional land was provided by the then owner, Thomas Oliver. The building (architect’s drawing left) was, as one might expect, very plain both inside and out. By 1880 the roof was in need of significant repair and in 1884 it was decided to replace the entire building with a third church. This picture of the Knowles Green area in Wellington Road is one of the oldest in the Discovery Centre collection. It would have been taken in the 1870s or early 1880s, soon after the railway was built. 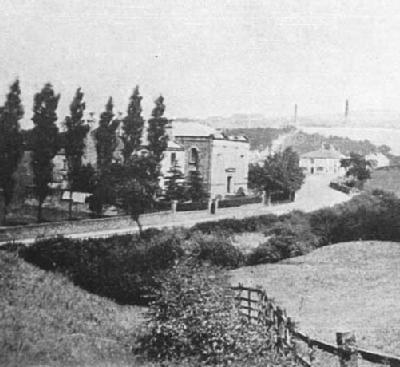 The picture is taken from the railway embankment in the left foreground. In the picture you can see the church with the Manse just to the left of it. The Weslyan Sunday School (today’s Arts Centre) had not yet been built (1914). In the middle distance the Dog & Partridge Inn stands proud. The light coloured area behind the Dog is the canal embankment which had been there less than 40 years at the time of the picture, which probably explains why the stone looks so new. There are no cottages or Town Hall along Wellington Road towards the Dog & Partridge. There are two chimneys showing over the canal – the left one is the original chimney behind Clarence mill, that on the right is the little chimney on top of Beeston quarry serving Oak Bank mill. The present, third, church was designed by William Waddington of Manchester and opened in 1886. The picture (left) was taken about 1960 – compare with the 1860s picture above. New church, same manse. The Wesleyan Sunday School is now in the background. This was completed by 1914. The picture (left) shows the original interior of the present building. In the 1980s major changes were made to improve its usefulness. A new floor was built approximately on the line of the balcony to divide the building horizontally, providing a church on the top floor and offices and function rooms on the ground floor. I believe the organ was removed at this time. In 2008 the tower spire was completely rebuilt. In 2012 the Methodists ceased worship here and the building was sold. In 2016 the lower floor was converted for use as a childcare business called Daisybank Nursery. The upper floor is one of the best performance spaces in Bollington so we were particularly sad to lose it when the building was put up for sale. It was especially good for Bollington Brass Band concerts. After a gap of some years it was a great pleasure to once again hold the annual Remembrance band concert in the building on 13 November 2016. The church is a Grade II listed building. After modification the church hall was decorated in the modern style providing a bright airy space which was used for a wide variety of activities. 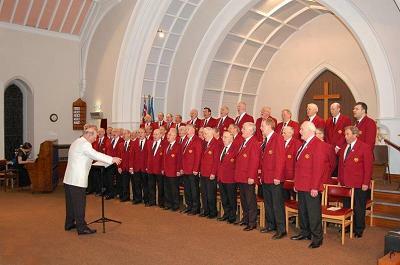 Illustrated is a performance by the Macclesfield Male Voice Choir. In May 2008 the Methodist church celebrated 200 years in Bollington. A history of the church was published – 200 Years of Bollington Methodism, which is available from the Discovery Centre . During 2008 a number of events marked the 200th year of Methodism in Bollington and the 100th anniversary of the opening of the present church building in Wellington Road. A history of the church was published – 200 Years of Bollington Methodism. An exhibition was held at the Library. A talk was given at the Library on Wednesday 19th March. A talk by Audrey Williams was given at the Library on Wednesday 14th May. A weekend of events was held on Thursday 15th May to 18th May. An exhibition was held at the Discovery Centre during May – June. This was a ‘tin tabbernacle’ on the corner of Grimshaw Lane and Rose Bank. This was a huge building in High Street standing where High Court is today. It was built in 1859 and demolished in the 1960s after it became unsafe (thanks to Janet Roberts ). Harry Bamford a local Bollington builder bought it when it ceased to be a place of worship and used it to store building materials in it (thanks to Malcolm Blunt for that nugget). The substance of this page has been taken from Jean M. Wright’s book 200 Years of Bollington Methodism, which is available from the Discovery Centre , and with pictures from the Civic Society historic picture collection which can be viewed at the Discovery Centre or online . My thanks go to those who researched and discovered the history that is presented in these pages, in particular to Jean Wright who wrote her researches up for the book, 200 Years of Bollington Methodism. Please read the full acknowledgement of their remarkable achievement.